Randy’s Saturday Night Genealogy Fun challenge was posted last night. This week I’m supposed to see how popular my name is in different decades. Since my name isn’t all that common, I’m going to guess that it was popular in the 1960s and 1970s, but not much before or after. Will I be right? My highest ranking is 188 in the 1960s. Popularity was maintained from the 1950s through the 1980s, then it declined. My name didn’t even show up in the rankings until the 1940s. So, I was right on that one. Looks like my name really hasn’t change much in popularity. It’s varied from 188 to 394. 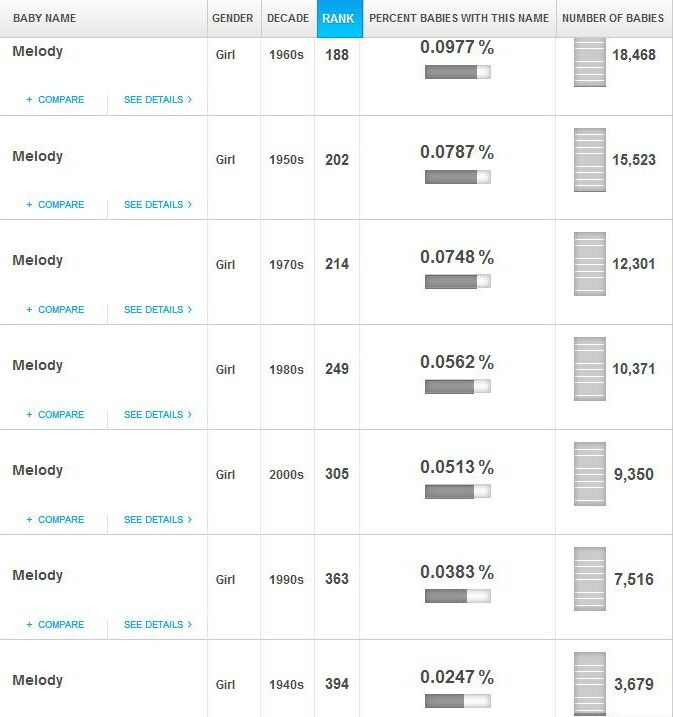 I guess there was never a really big wave of Melody’s being born. I didn’t get a chance to do this for my blog but I went back and did it for fun 😀 My name was most popular in the 1930’s and declines from there. I guess maybe I should have named my daughter after me instead of Jessica! I thought that was a different name until I sent her to kindergarten and found three other Jessica’s in her class!